Established in 1984, Damp-Proofing & Timber Treatment also known as London Damp Busters have been providing solutions to eradicate damp in London, control mould and treat condensation for over 30 years. Their damp proofing solutions and timber treatment services are available to domestic customers, businesses, builders, property developers, letting agents and landlords. Their damp consultants are highly experienced in the prevention of damp and will recommend the best solution for your residential or commercial property in London. Get in touch today to resolve damp in Ealing, Notting Hill, Clapham, Queens Park or Harlsden. Their condensation treatment surveyors carry out thorough assessments to help homeowners, landlords and commercial clients find the right condensation control system for their premises. 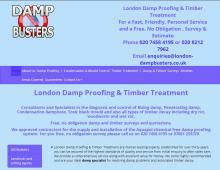 Contact London Damp Busters for damp in Ealing, Notting Hill, Clapham, Queens Park, Harlesden or nearby London areas. They also offer woodworm control, dry & wet rot treatment, timber surveys and mould control.